With the new laws for children’s car seats fast approaching it’s time we did a small bit of reading to make sure we keep our kids safe on car journeys. On the 01st of March 2017, the Government are planning to re-classify the group classification from Group 2 to Group 3 for all newly developed booster seats. What does this mean? This means that after this change in law any new booster seats being launched to the market place and seeking approval to be sold in the UK will be classified as a Group 3 not a Group 2 car seat. Group 2 car seats are suitable for children weighing from 15kg (this is the vast majority of children aged 4 years old and up). 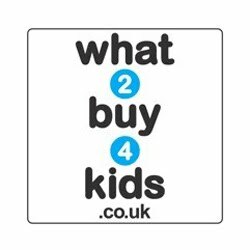 Group 3 car seats are suitable for children weighing 22kg (this is the vast majority of children aged 6 years old and up) or measuring over 125cm, whichever comes first. 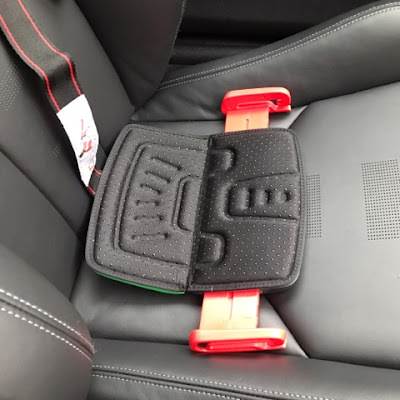 However, if you already own a booster seat before this change in law which bears an R44/04 Group 2 label, then you will not need to replace it, it will still be 100% legal for these booster cushions to be used for children from 15kg and the parents will not be breaking the law by using them, even once the new regulations come in. Existing booster seats will continue to be sold with a Group 2 classification. The Group 3 classification will only be applied to new booster seats that have been developed after the change in law has been passed, not existing booster seats. To give you an idea my son is 7 and about 127cm in height. I’m not entirely sure of his current weight but he’s strong and sturdy so definitely more than 3st 6lbs (22kg). He currently has a backless booster seat which is ok and correct under law but I often feel it’s not safe enough. Jon and his company have definitely achieved what they set out to do as the mifold may be small but it is mighty. It’s the most advanced, compact and portable booster seat on the market to date and fills a gap especially for older children. As I said above my son comfortably fits into the law of using a normal backless booster seat but he’s getting older and well booster seats aren’t really cool are they. Of course coolness doesn’t have a scratch on safety when you’re a parent but when there’s an alternative that’s just as safe you’ll do anything to keep your child happy. The mifold is just as safe as regular booster seats (if not safer) and meets the highest standards for child restraint systems and is approved by the European regulation R44.4. The mifold measures in at 25cm x 12cm x 4cm and when in the car and being used you can hardly notice it. I found it very easy to use and had Logan strapped in and ready to go in under 45 seconds. So how does it work? You unfold the mifold (colour side down), adjust the side arms width to suit your child (Logan is on the middle size), adjust the shoulder strap to required length. When you’re child is sitting on the mifold you simply clip in the seat belt making sure the lap belt part is inserted into the both lap belt guides at either side. The clip the mifold shoulder strap onto the chest seat belt to hold it on the shoulder. Sounds a bit boggling when written down but when you’ve done it once it’s simple to do again and again. Plus unlike a normal booster seat which raises the child up to the seat belt, the mifold brings the seat belt to the child providing optimum safety because the lap belt is away from the tummy and the chest belt is away from the neck. I kept Logan in a high backed child car seat until he was around 4 because I just didn’t think a seat belt and booster seat were safe enough when he was little. I’d rather have a clunky car seat than a child with serious tummy and neck injuries. 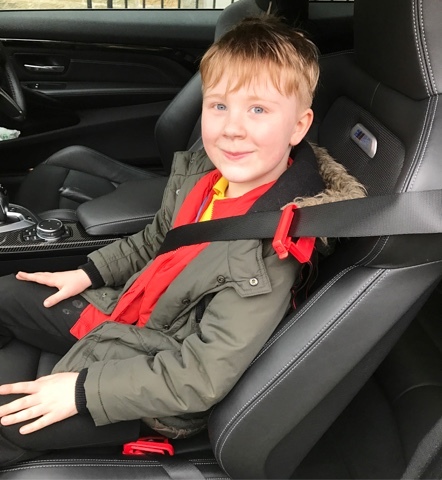 The mifold ticks all the boxes for older children though because, as I've just described, it brings the seat belt to your child ensuring their safety in the event of an accident. 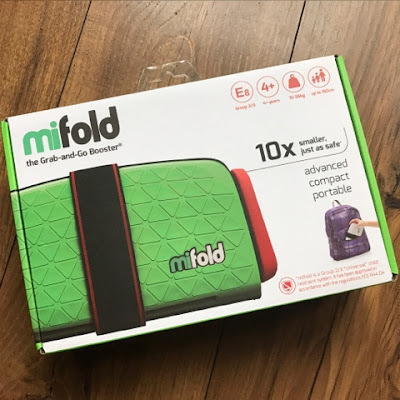 As well as being safe the mifold is compact making it the perfect booster seat to keep in the car or take on your travels. At 750g the mifold weighs the same as a small bottle of water and is shaped so that it can fit inside a backpack comfortably. It’s fab for giving to grandparents if they have the kids and if you’re taking an extra child or two in your car there’s lots of space when using the mifold. Big booster seats often can’t sit side by side in the car but having the mifold means that 3 kids could sit side by side in comfort. Another perk is if you travel a lot and need a booster seat with you for your child. We used to holiday a lot in Fuerteventura and their child car seat laws are similar to the UK so when getting a taxi Logan would have to sit in a car seat. Sometimes there wouldn’t be one available or the ones that were didn’t look too fantastic. I don’t need to worry anymore now that I have the mifold, I only wish it had been invented sooner! 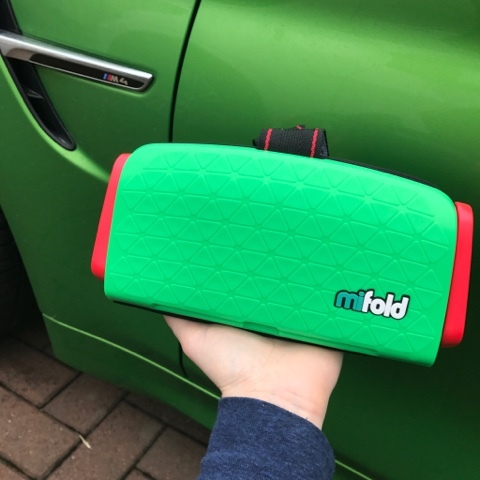 Logan really liked his very own mifold and he received the Lime Green colour which matches our car so he was very pleased about that. The only thing he complained about was not being able to see out of the window as well as he could with his other booster however I’d rather he was safe than getting a good view. There’s six different colours to choose from and even a designer carry bag if you want one. The mifold retails at £49.95 which I think is majorly cheap to ensure your child’s comfort and safety in a car. Plus with the whole compact portable aspect it’s worth it’s weight in gold. I was sent a mifold free of charge in return for an honest review. 1 comments on "Review: mifold - The Grab-and-Go Booster Seat"
He looks so pleased and clearly feels very grown up! My big two are still in their high backed boosters and will stay in them for as long as possible as I prefer the additional protection they offer - but I can totally see how this is really handy to have around.